Spring is here! And in celebration of it’s arrival I’d like to announce my…. Over the last few weeks I’ve had many requests and inquiries about Easter and Mother’s Day mini-sessions, and while I don’t do them often, I’ve decided to kick-off the Spring season with them. I have a feeling they’re going to book fast because it’s a fantastic deal! If interested, please fill out the form below to tell me your preferences on day, location, and time. It will be first come first serve, so please let me know as soon as possible. And of course you can always get in touch with me via email or phone: 917-697-1835. I’ve got the perfect thing for Mom, and both Grandma’s too! 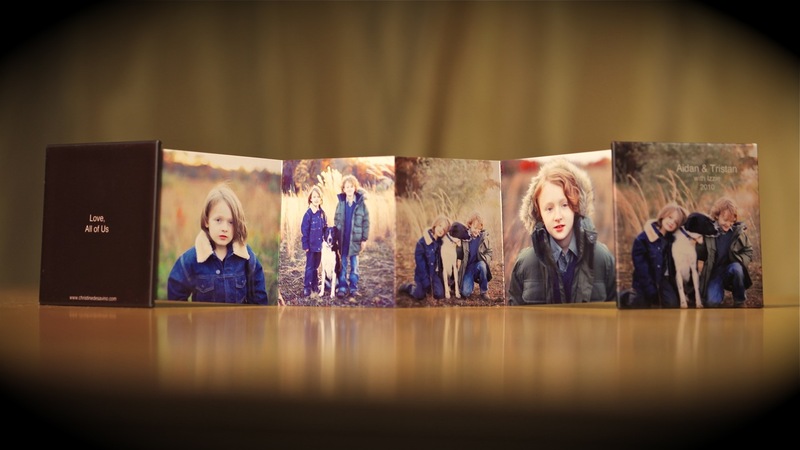 These Mini-Albums come 3 per order and make fantastic gifts! I gave the above Mini to both my mom and my mother-in-law for Christmas…..they loved them! And I got to keep one too! They fold down to about 3 square inches and fit easily into a pocket or purse. 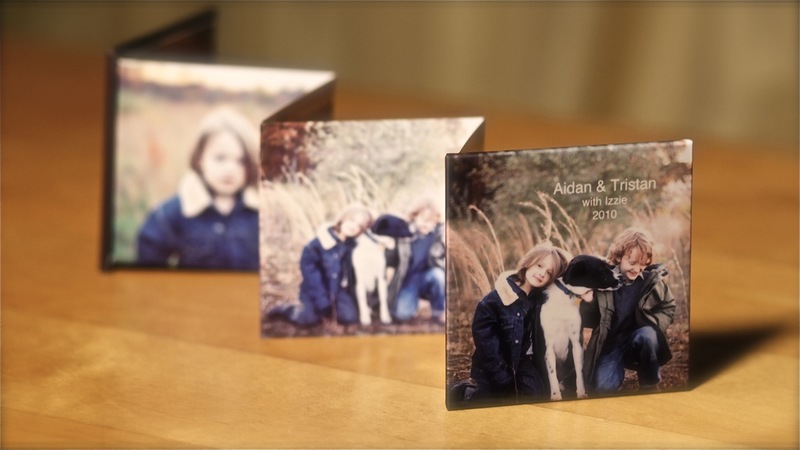 When opened, they display up to 6 images in front and 4 in back and are the perfect way for any proud parent or grandparent to show off the kids! Look no further for your mother’s day gift this year. 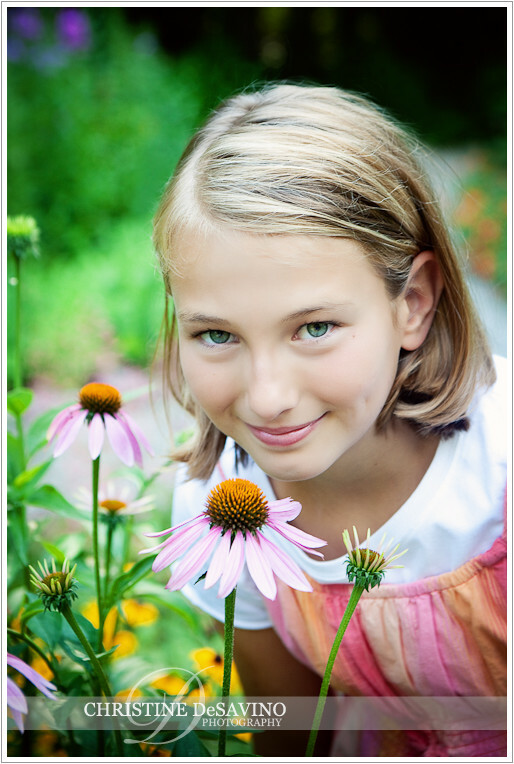 OK…this is just the kind of angelic face that makes me, the mother of two wonderful boys, want a little girl. 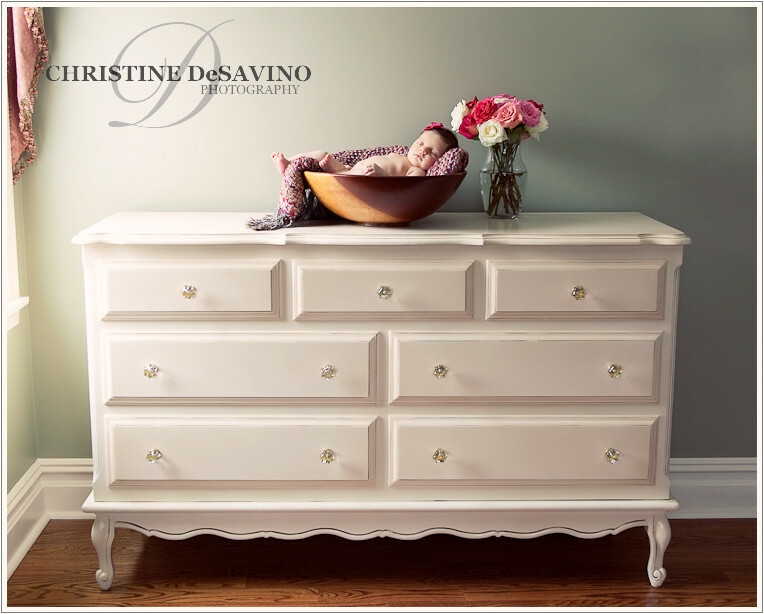 It happened a year ago at her newborn session and it happened again a year later during her one year session. Doesn’t help that she is sweet as pie with me…I could just take her home! OH and the accessories…bows, flowers, pearl bracelet, pink slippers…I was dyin! And here is her big brother, who I photographed last summer. In this first photo, I caught him entranced by the tv and I just love the feel of it. Soon afterwards he was engaged and smiling. I think it’s the sparkle in his eyes that makes him such a beautiful model …just like his sister! Don’t worry guys, the snow’ll be gone soon and we’ll all be outside playing! Sanna - One forgets how different a nine week old is from a newborn. Outdoor winter session….hmmmm….I’m kind of a wimp about the cold, so I was a little worried. I think I wore about 15 layers just to be sure I’d survive. Well, the temperature was no problem for these dapper cousins. Some kids are just oblivious to the cold and these guys were too busy having fun to even notice that it was winter out. Granted, this was before the onslaught of snow, but still! Anyway, talk about great models! Look how handsome they are and I love their natural posing. The grounds at Ringwood Manor made braving the cold so worth it! I love the natural textures of wood, stone and ivy…what beautiful backdrops. A huge thank you to their aunt…she not only arranged the session as a surprise to her sister and mother but she was AWESOME at getting them to giggle at just the right moments!!! Love that! 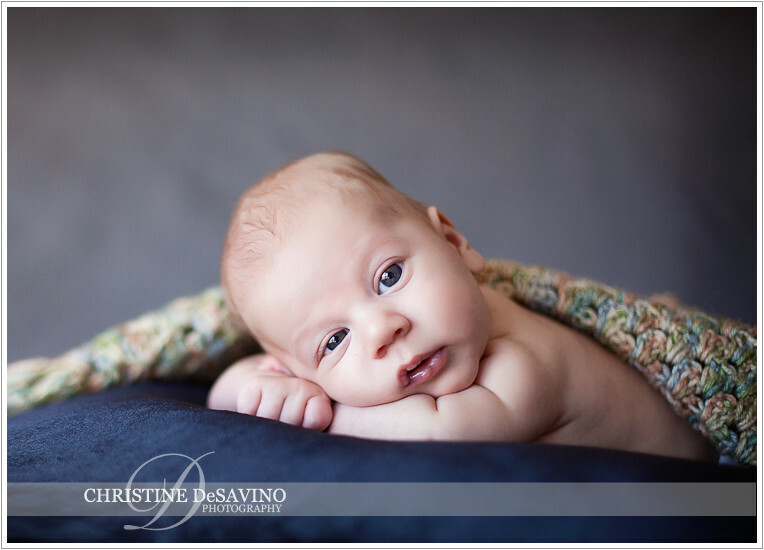 Three months is very young…yet there is such a big difference between a newborn session and a three month old session. At three months, babies are alert, can hold their heads up and can even push up off their bellies sometimes like this little boy. No more teeny-tiny, sleeping baby poses…instead it’s wide eyes, cooing and hopefully with the right prompts, some adorable smiles. Some people feel you can see more of your baby’s personality at this age and so decide to wait until the 3 or 6 month milestone. I have to admit, I love photographing BOTH stages! 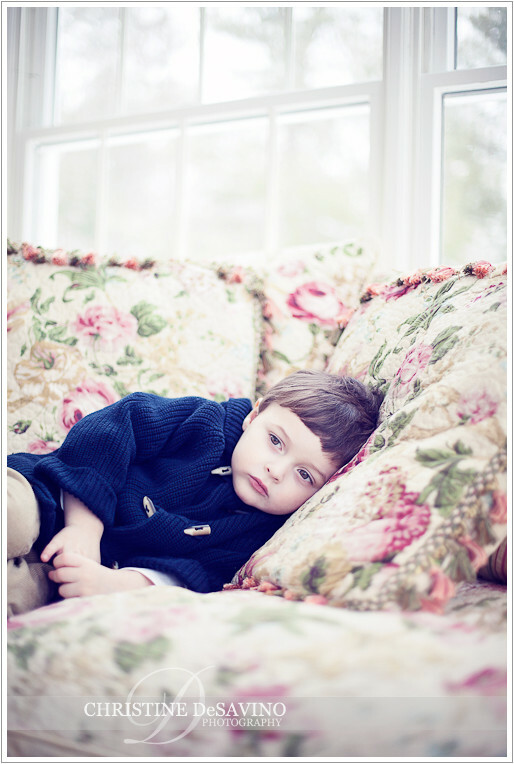 This little boy was such a joy….he was so calm and pleasant, and barely fussed at all. The secret to keeping him engaged…just jingle some keys and he was happily interested! These family shots are among my favorites…mom and dad had such a warm and gentle way about them and I really feel that this comes across in these images.